So your heart is set on a boat charter Mediterranean vacation. Among the many fantastic countries that are laced along the Mediterranean shore, Turkey is considered a prime hot spot for gulet charter holidays by travelers. Although still quite a new seafaring holiday in tourism, gulet charters are well recognized by their elegant and graceful architecture. However, these boat charters are mainly referred to as Turkish wooden boats or sailboats, not many know that they are actually called gulets. Interesting enough, they are booked as Turkish boat charters instead. Turkey has been a prime holiday destination for many decades, particularly in the late 80’s and onward into the 90’s when it reached prime visitor volumes. Except for the the far eastern border, Turkey is surrounded by many seas – among which are most favored in the south and southwest. 300 days of sunshine combined with both a Mediterranean climate, as well, only hours away from most European countries, Turkey stands out in choice. In tourism, one of the features that has been reaching great heights in alternative vacations for families and group travelers is gulet charter holidays. 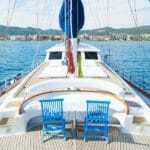 While some book a gulet for a week, others rent a gulet for two weeks – otherwise known as blue cruises. The most popular embarkation points are delightful city of Fethiye, the charming town of Gocek, the spectacular seaside city of Marmaris, and the remarkable harbor city of Bodrum. Airport access to and from these lovely ports and harbors are convenient. While Marmaris is 90 km away, Bodrum only 40 minutes’ drive, Fethiye an hour, the town of Gocek is a mere 15 minutes – making it one of the number one choices for the start of gulet charter Turkey vacations. These timeless Turkish yacht charters are a whole different experience than exploring Southern Turkey aboard a motor yacht or bareboat. 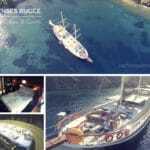 Depending on the boat hire, gulet charters can be run by professional agents, owners or for the more standard and luxury gulets – run by the families who own them. This adds more character to these splendid journeys at sea. Again, depending on the gulet hire, one can travel on a boat charter Mediterranean style along the Turkish coast, or go further over and down to the neighboring Greek Islands. The Dodecanese and Cyclades are the closest to the Turkish shores. However gulet charters can cruise to the other island groups found in Greece; such as the Sporades, Cretian islands and the Ionians. Some Turkey gulet charters, such as the super luxury sailing yachts, can go even further to Cyprus. 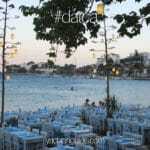 There are so many different variations in planning a gulet charter itinerary from Turkey. 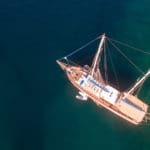 Among a few other details, all it really takes is to find the gulet boat for hire that is right for you and your group and what part of the Mediterranean or Aegean or both you wish to visit! History and culture is found all throughout the coast and nearby inland, therefore you will certainly have opportunities for much to explore. Sometimes travelers will combine their gulet charter holidays with a bike tour or a hiking trip to add a bit more fun, adventure and scenery perspective to their vacation. You can too! With all these reasons and more, gulet charter holidays in Turkey is a prime hot spot for travelers from around the globe!